While Dr. Martin Luther King, Jr.’s life may have been tragically and violently taken on April 4th, this date has transformed into a revitalizing annual call for reflection on and deepened engagement with King’s legacy. IMAN staff and organizers spent the day playing key roles in several events across the city, responding to the call for building a truly beloved community by helping bridge various communities with a common desire for justice. Several senior staff members attended a daylong Truth, Racial Healing, and Reconciliation session sponsored by the Kellogg Foundation. Alongside faith leaders, fellow organizers and influential members of the local philanthropic community, IMAN representatives lifted up the struggles and triumphs of those most directly affected by today’s most urgent socio-political challenges. Longtime partner Chicago Theological Seminary hosted the seminar, which concluded with a stirring artistic performance by poet and songwriter Avery R. Young. 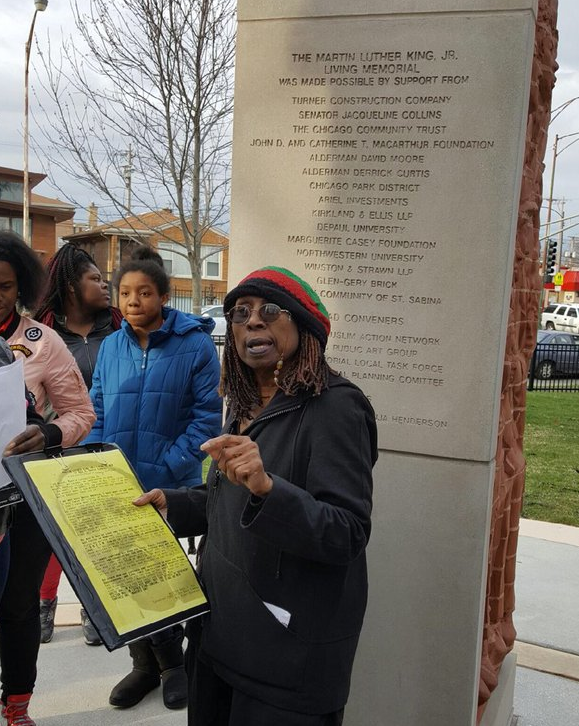 Marquette Park’s MLK Living Memorial was the site of a powerful gathering sponsored by Hip-Hop DetoxX, an arts-centered youth empowerment organization spearheaded by Chicago music mainstay Enoch Muhammad. Dubbed “The Apology”, the event brought IMAN staff together with many residents who’d never before visited the MLK Living Memorial. This ceremonial remembrance opened up a unique intergenerational space for local elders to encourage young leaders to continue to strive for healthier community life. 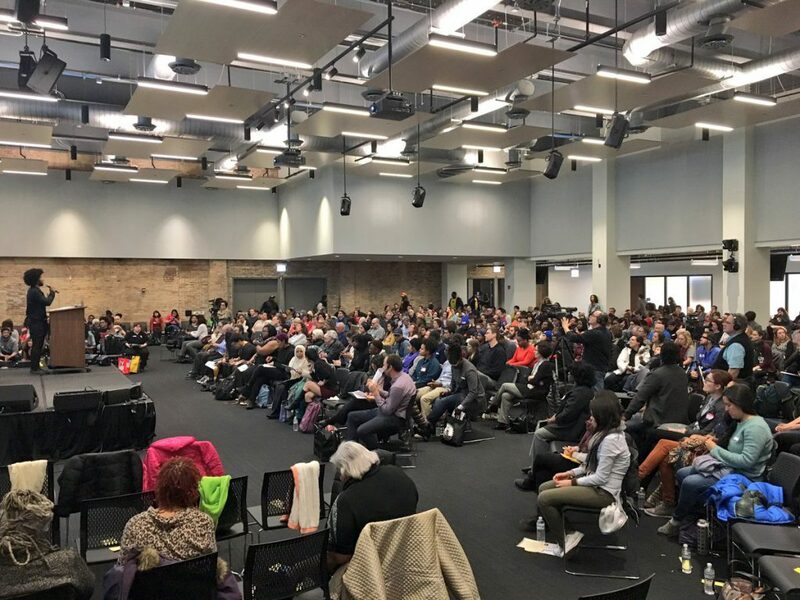 Finally, that evening IMAN organizers and artists joined a diverse crowd of over 500 Chicagoans for the Resist, Reimagine, Rebuild teach-in. Youth leader Selma Dee and longtime IMAN arts contributor Tasleem Jamilah kicked off the event with extraordinary vocals, and organizations across the spectrum of social justice efforts set the stage for a truly special gathering. As part of the #FightFearBuildPower campaign, our organizers continued bolstering key alliances in the city as a means of mutually strengthening one another’s respective efforts. Continuing the work of removing the “invisible bars” that restrict the formerly incarcerated, IMAN organizers have mounted a grassroots campaign to address the injustices of a registry system that threatens to further criminalize men and women who are trying to pull their lives back together after lengthy incarceration. This effort is led by those most directly affected by the harsh policies standing in the way of returning citizens’ successful reintegration into communities. The Illinois Murder and Violence Against Youth Registration Act requires certain offenders to register their names, addresses, and recent photos into a public database. The state requires formerly incarcerated individuals to register by virtue of their conviction record, among other criteria. Returning citizens face tremendous barriers to job placement and housing upon their release, and the current registry system often serves as a form of perpetual punishment for an already vulnerable population. 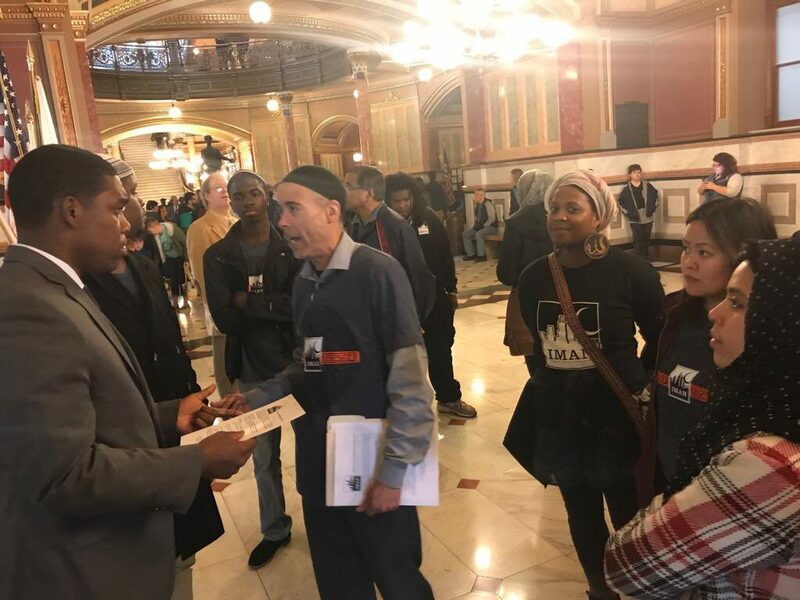 Amid growing national concern over issues of surveillance, IMAN leaders catalyzed this campaign recognizing the thousands of individuals in Illinois that this policy adversely affects. Several Green ReEntry program participants and alumni are currently mandated to register, some of them for the rest of their lives. Through engaging the issue at weekly post-prayer breakfast gatherings, organizers began to build local power in the Marquette Park community by centering weekly Grassroots Power Hour gatherings on the impacts of the harsh registry system. Organizers also traveled to Springfield to push legislators to consider several key amendments bringing fairness to the current policy: allowing registrants who’ve demonstrated exemplary conduct to petition for early removal from the system, offering fee waivers to registrants without any income, and introducing a measurement system to assess the registry’s impact on recidivism and other factors. Want to get involved in the continued push to remove invisible bars and #FightFearBuildPower? Contact Senior Organizer Shamar Hemphill at shamar@imancentral.org, and be sure to attend Grassroots Power Hour each Wednesday at 5:30 pm.